Membership is easy. 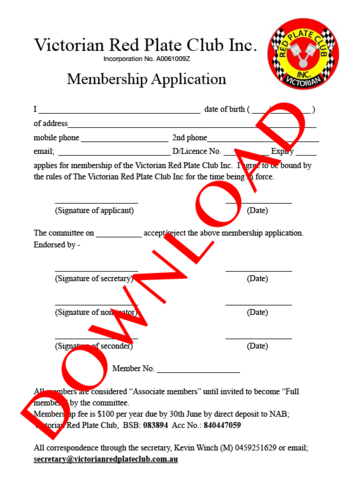 To join complete the top section of the Download Victorian Red Plate Club Membership Form and send a digital copy to email. Don't worry about the nomination section. Provide a copy of your driver's licence with your application. A current roadworthy is required or be thinking about getting a Roadworthy Certificate. If you are an existing member of another club and already have a vehicle on club plates then no roadworthy is required but we still need to scrutineer the vehicle. There are a lot of cars on the "H" plates that should be on "M" plates. It's not just an automatic swap over of clubs. Don't get upset with the secretary if your supercharged Nitrous powered burn out car on H plates is rejected. It has happened. The secretary will reply to your enquiry ensuring you receive excellent service. This may be the last thing on the long "To do," list of getting your vehicle on the road. We try and make this as painless as possible. If you have a standard vehicle you can leave the club process to last before going to VicRoads BUT if your vehicle is modified or has some issues such as recently imported we highly recommend that you come in early in the process. From experience, this may save a substantial amount of grief and money. A copy of your driver's licence to corroborate your identity is required. This is not a specific requirement by VicRoads BUT VicRoads do require on their forms your name, residential address where the car will be garaged, your driver's licence number, date of birth and a contact phone number. VicRoads use the drivers licence number as a customer number. It is best practice for our club to maintain a register that includes corroborating evidence of the member's identity. The secretary signs these documents stating the details are true and correct. A vehicle owner is not required to have a Victorian drivers licence or in fact any drivers licence. VicRoads should accept the vehicle details even if there is no drivers licence. If you are unable to provide a drivers licence we will ask you for an alternate proof of identity document. Your information is kept confidential. It is only provided to VicRoads if requested. To register a light vehicle the minimum age is 17 years. For a motorcycle it is 17 years and 9 months and 18 years for a heavy vehicle. VicRoads have removed the loophole where pets could register a car. If after you have made the enquiries and you feel this is the club for you, pay the fee. Our fees are simple, an annual membership of $100 is due at the start of the financial year. We have a pro rata system for new memberships as the year progresses. For every vehicle put on the CPS we also have a one-off $50 scrutineering fee. As an example If it were January and you had just received the roadworthy for your lovely old car, the fees would be $50 for membership and $50 for scrutineering. Then add the VicRoads Fee for the plates paid to VicRoads. 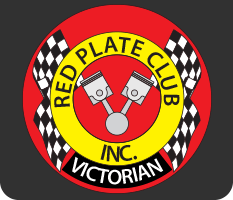 Direct deposits can be made to Victorian Red Plate Club BSB 083894 Acct No. 840447059. A subject for special mention is when to pay. If you want prompt service then you should make the payment promptly. If you delay the payment the paperwork will be equally slow. Our time frame for service is the same day if you attend in person or next day via express post when all the photos are sent and all is correct. VicRoads Fees are paid to VicRoads and increase slightly each year on the 1st of July. A 90 day permit is broken down into a permit fee of $46.20, a log book fee of $3.00 and a TAC charge of $101.20 which equals the total payable as $150.40.